Text and interactive story games aren't just for gamers anymore. They are the most imaginative, well-written, visually stunning, and original games for you to play. Unlike puzzle or arcade games, the best adventure story games spark the imagination, get you invested in the story, and try to give you a complete narrative experience. 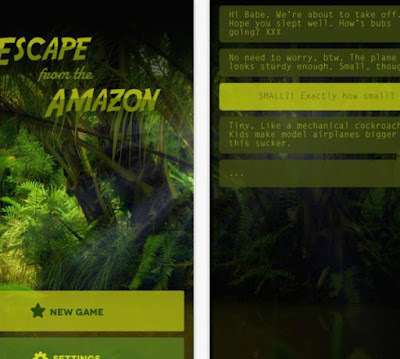 One of the best interactive story games on the iOS platform is Escape from the Amazon that features interactive story that combines the best of the much loved “choose your own story” with all kinds of exciting possibilities in its core. It's about a story. Interesting story, story that you can change with your decision making and responses. Your partner and his travelling friends. Their plane crashes in a remote area of the Amazon rainforest and now it’s your turn to save them. You can help them by responding their messages - them directly in the game or from your notifications screen on your iPhone or iPad. Because it all comes down to how will you respond, think thoroughly, challenge your knowledge and you will help them escape. Specifications - Who Can Play It? It is designed with realistic graphics and sound effects and it follows a fun storyline, accompanied with a very engaging gameplay. Also, the game requires iOS 8.4 or later, it is compatible with iPhone, iPad, and iPod touch, it can be played without Internet connection and it is completely ad-free! Escape from the Amazon is available for only $0.99 on the App Store. Get it today and enjoy this one of a kind adventure!